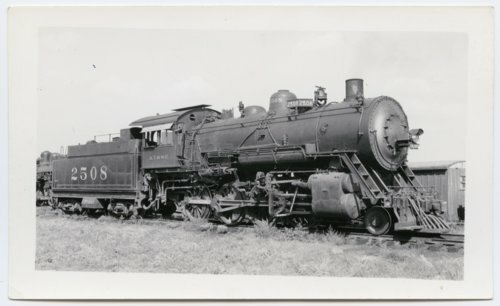 This photograph shows the Atchison, Topeka & Santa Railway Company's steam locomotive #2508 in Clinton, Oklahoma. The locomotive, built in 1907 by the Schenectady Locomotive Works Company of Schenectady, New York, featured a 2-8-0 wheel arrangement. It operated along the Kansas City, Mexico & Orient rail line.